What is the role of Dietitians? 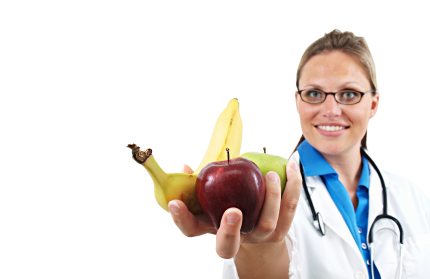 Dietitians or Nutritionists are the experts in the field of food, nutrition and dietetics. They deal with food, their properties and their effect on each individual seperately. Dietitians has ability to use food as medicine to treat various disorders and thereby give a heathly life. Dietitian professionals specialize in various fields like clinical practise, weightloss, food service, research, sports, public educator, freelancer. But, the motive is to give everyone healthy problem free life. Dietitians plays role since the foetus is in mother’s womb. The requirements of nutrients starts before birth. Dietitians are the one who decides which food is best suitable in which particular condition and at which stage of life. Dietitians advise the best food for a person from the list of foods available. 1. Prescribe and advise diet to the patients to treat or prevent various lifestyle related disorders and diseases. 2. Dietitians also look after the RT tube Feeding ( http://www.suru.com/ryle.htm )of the patients who are unable to chew food. 3. Dietitians supervise the quantity and quality of food consumed by patients through dietary recall method. 4. Dietitians calculates the present calories intake of person and accordingly plans and recommends diet with repairing all the loop holes and thereby give a optimum nutrients fllled diet. 5. Dietitians also work for food industry to keep the quality check of foods. 6. Dietitians are also invloved in food service management. 5 star hotels recruit deititains to take care of the health of the clients. 7. Dietitians has an excellent skill of conselling do that clients change their food lifestyle in oredr to live a long and very healthy fruitful life. 8. Dietitians has ability to formulate their own personalised product and selling it amoung the target groups. 9. Dietitians meet patients in hospital and solve their food related queries and myths. 10. Dietitians involved in social work helps the people to recognise the importance of food and teach them few recipes which they can include in their diet to increase the nutritional value of food. Role of dietitian is no less than a doctor, as after allopath, homeopath, ayurveda comes food and nutrition. I feel proud to be a dietitian and help my fellow people around. what do dietitians do, what do nutritionists do?, What is teh role of dietitian? what is teh role of nutritionists? One Response to What is the role of Dietitians? I am highly impressed by your very useful health & Diet articles. Please suggest me some excellent reference books (Indian and General)for Diatesians and send to my email please.